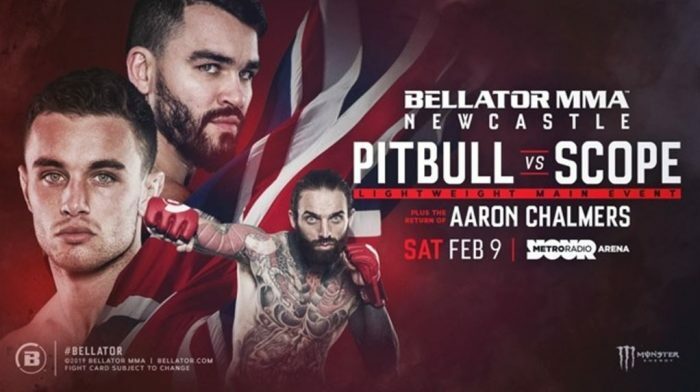 Bellator have announced the full fight card for their upcoming Bellator Newcastle event on February 9. Bellator will return to Newcastle, England on February 9 for the first event in their European Series. A press release this morning confirmed several fights which MMANytt reported last week including Patricky Freire vs. Ryan Scope (HERE), Terry Brazier vs. Chris Bungard (HERE), and Lee Chadwick vs. Fabian Edwards (HERE) all confirmed. Also featuring on the card, hometown man and UFC veteran James Mulheron (11-2) will take on Arunas Andriuskevicus (11-4), whilst another local fighter Colin “Freakshow” Fletcher (16-10) faces Mehrdad Janzemini (10-3). The press release also confirmed a fight first alluded to be Cage Warriors President Graham Boylan with Lewis Long (16-5) taking on Jim Wallhead (29-11). Other British fighters including Ashley Reece (6-1), Dominique Wooding (5-2) and Nathan Rose (6-1).